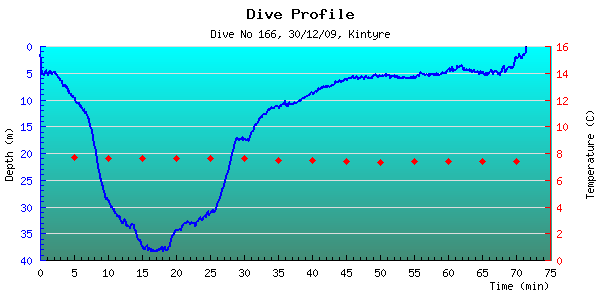 Description: Great dive on the wreck of the Kintyre from the shore of Weymss Bay. Followed the pipe down to the new blue rope which took us straight onto the bow. Visibility was decent enough and the life on the pipe and wreck was abundant as usual. Lots of edible and velvet swimming crabs. We went as deep as the boilers before returning to the pipe and ascending to complete our deco and safety stops in the shallows. Once we has completed our stops Scott and I went on to search for two anchors in the region of 3-4m depth but we were unsuccessful. When we surfaced the snow was falling lightly but it became heavier as we got changed. Entry/exit point is treacherous when icy as it was this morning.